The FinePix F300EXR is a powerful and versatile digicam featuring a 12-Megapixel imaging sensor, 15x optical zoom lens, 720p HD video capture and Phase Detection Pixels. These features allow for incredibly fast focus and outstanding image quality. Read more in our Full Conclusion. One of FujiFilm's latest EXR equipped models, the FinePix F300EXR is a sleek, yet powerful compact camera that boasts some serious features. These include a 12-megapixel EXR Super CCD image sensor, 15x Fujinon optical zoom lens (24 - 360mm equivalent range), a high-resolution 3.0-inch LCD screen, Intelligent Image stabilization, 720p HD video capture, and their new Hybrid High Speed Autofocus mode to name a few. All of these features are packed into a stylish and durable metal shell, which Fuji used two coats of lacquer to create a beautiful finish. On top of that, the F300EXR is small enough that you can still slip it into your pants pocket; which is impressive when you consider it's packing a 15x optical zoom. 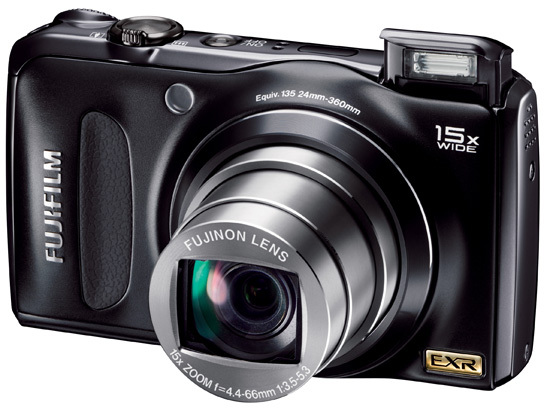 The FinePix F300EXR is available now with a suggested retail price of $329.95 US.